Distribution Day has arrived! I wake up early to prep the kits and not-so-patiently await the arrival of the Golden Girls Foundation (GGF), our partners in distribution of the Ruby Cups. I've been dreaming of this day since leaving the states and I am eager to see the schoolgirls' reactions to the menstrual cup. Many women in my own country haven't heard of this incredible product, and I stand behind it so passionately as a period game-changer that I am eager to share my love for the cup with other girls and women around the world. Will they like it? Will they try it? Only time will tell. The Rift Kits are nearly complete! 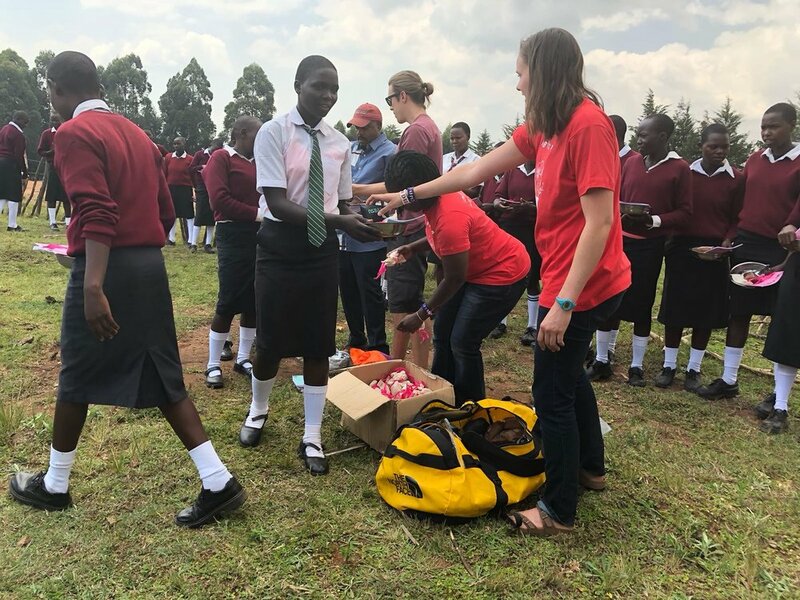 After the girls complete the cup training session, they will receive a Ruby Cup, a boiling pot to keep it clean, a notebook for the 12 week educational workshop and a reusable Chicobag. Right after lunch, Golda, the founder of GGF, and Miriam, a trained mentor, arrive to Iten. We sit down for a cold soda to discuss the two days ahead. Last year, GGF distributed 10,000 Ruby Cups to girls in need. This year, they aim to do the same. Golda gives me a run down of how she introduces girls to the cup. "First and foremost", she explains, "we want the girls to feel comfortable and not like they're in an academic environment. This is girl talk, not class". Planning the day with Miriam (center) and Golda (right). Up first, we go to Kamariny Primary School. We anticipate that 40-60 girls have reached the age of menstruation and will be eligible to participate in the Ruby Cup training. Tomorrow, we go to Shoe4Africa Martin Lel Secondary School. The later school is much more rural and is the Kenyan equivalent of high school. There should be over 120 girls that attend our class. We start the class with some games to break the ice. Up first: leap frog, a game where everyone stands with hands in a circle and slaps the palm of the person next to them in succession. Played to the tune of "Down by the banks" in America, I didn't realize this game had a Kenyan version. Once the girls are laughing, we know we can start. Without missing a beat, Golda starts the class bouncing back and forth between Swahili and English to determine which language the girls feel more comfortable learning in. Girls just wanna have fun...and menstruate worry free. A week ago, I had handed out a survey to gauge what the girls knew about menstruation and what products, or materials, they used every month. When I read the papers in the nights that followed, I discovered with surprise that the girls had unanimously written 'pads' or 'sanitary towels'. 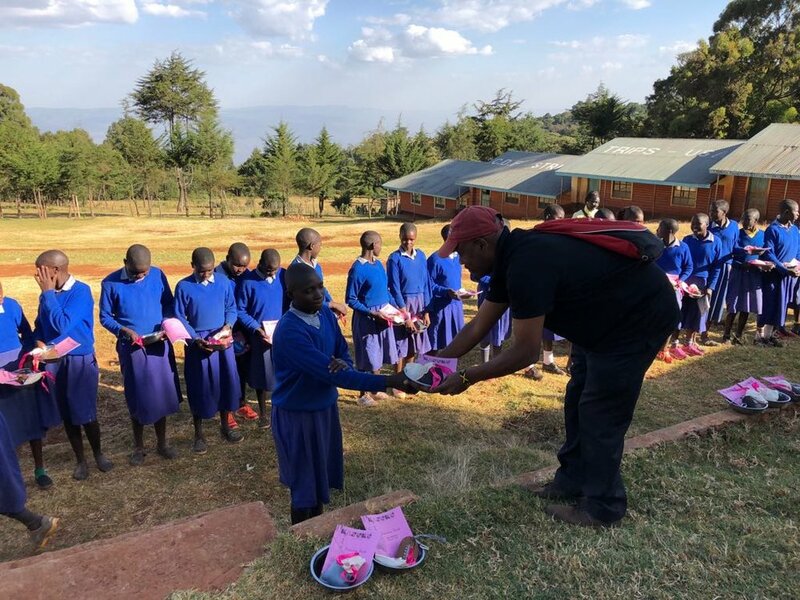 The answers were contrary to what I expected, especially given the fact that many of these girls live in impoverished families that can barely afford school fees, let alone sanitary products. But during this distribution day, Golda and Miriam quickly got to the bottom of it. At the start of the class, Golda asked the girls the same question, and received the same answer: pads. But Golda wasn't convinced. Smiling, she asked the girls to be honest; asked them what they actually used. A few nervous glances went around the room, and then one girl bravely said "mattress" and others joined in support. Another girl shared she used rags. And soon, everyone was laughing. From there, the lesson turned conversationally anatomical. How many holes do we have down there? It may seem obvious, but the answer takes a moment of thought. There's a lot going on down there. Especially when you're 16 years old. The girls enter a conversation of anatomy and what each hole is for. It's about now when we decide to introduce the menstrual cup. The beauty of this training and these workshops is that it is all about choice. Golda explains to them that this is an option, another tool in their menses kit so to speak, that they can try if, and only if, they want to. Miriam, a trained mentor from GGF, answers questions of how to use and care for the Ruby Cup. The girls ooh, aah, and giggle over the cup. Golda and Miriam cover the basics about how to use the cup. The importance of being relaxed, trying different folds, and being patient. Also important is how to care for the cup, which involves changing it with clean hands, rinsing it with drinking water, and boiling it in between periods. Menstrual cups are non-toxic to the body, free of harsh chemicals found in the cotton of tampons but it is also important to take care of the cup so you aren't introducing germs from the outside world to the inside of your body. At the end of the session, we offer the girls the chance to try the cup, with the rest of the kit available to them regardless. Over 130 girls elected to try the Ruby Cup, with many of their teachers braving the same. It was an exciting day; to see these young girls summoning up the courage to try something new that will help them better manage their menses. But the journey to empowerment had only just begun.